Jordan Bartram and Elizabeth Mabe have not been seen since Saturday afternoon. Two teenagers have been reported missing from Fife. Jordan Bartram, 15, has not been seen since around 2pm on Saturday and Elizabeth Mabe, 16, was last seen at around 5.30pm the same day. 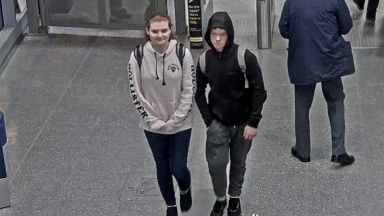 The two teenagers are thought to be in each other's company and are missing from the Cupar area. A confirmed sighting places them together at Dundee Railway station about 8:15pm on Saturday. Their current whereabouts are unknown and they may have travelled on from Dundee using public transport. There has been no contact from either Jordan or Elizabeth and due to the length of time they have been missing, their friends and family are becoming increasingly concerned. Jordan is described as 5'5", slim build with short brown hair. He was last seen wearing a dark coloured hooded sweatshirt, grey jogging trousers and black trainers. He was in possession of a rucksack and may have other clothing. Elizabeth is described as 5'6", slim build with long brown hair. She was last seen wearing a light pink coloured hooded sweatshirt with 'Hollister' written on both sleeves, black jeans and black shoes. Elizabeth is also in possession of a rucksack and may have other clothing. Inspector Jill Moss from Glenrothes Police station says "Jordan and Elizabeth have been missing for over 24 hours now. "The length of time that they have been away from home, along with not being in touch with anyone is out of character for them both. "Family and friends are becoming increasingly concerned for them and I would urge Jordan or Elizabeth to get in touch with someone. If you believe you have seen Jordan or Elizabeth or have any information please contact 101 quoting incident no. 2148 of November 24 2018.